Not sure if this thread works with every state has there own thread. Just seems abit confusing. Interesting none the less. Hi stevo. l thought this probably the best place to put obs' re: developing Invests. It doesn't really fit into any particular state. The other low at 169e 9s is looking good on the 26th Dec. Worthwhile keeping an eye on. The MJO is also in Phase 5 and normally proceeds clockwise. The MJO is info about east /west latitude activity.. Is that how l read it. In recent days, a moderate strength pulse of the Madden–Julian Oscillation (MJO) moved into the Maritime Continent, north of Australia. At this time of the year, an MJO in this region typically leads to enhanced rainfall across northern Australia and the Maritime Continent. After experiencing relatively dry conditions in recent months, significant rainfall totals in parts of Papua New Guinea were reported during the past week. An MJO pulse can also aid the development of the monsoon over northern Australia, leading to widespread, heavy rainfall. 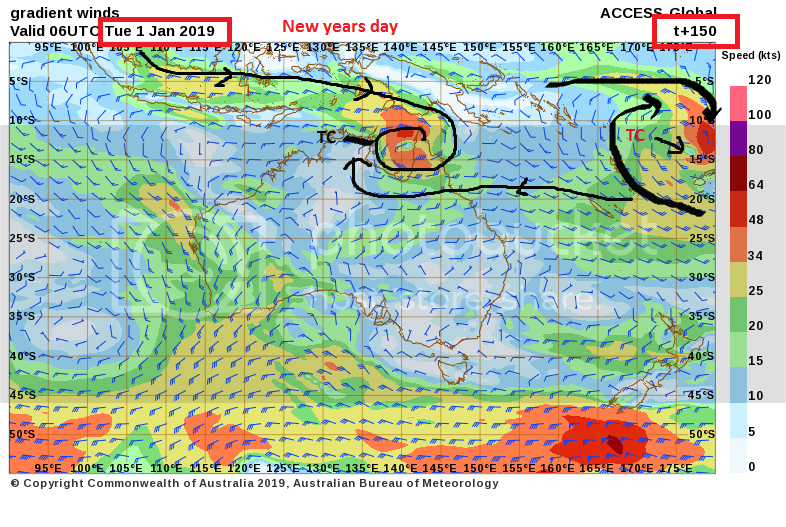 Under the right circumstances, an MJO in the region can also significantly increase the likelihood of tropical cyclone formation, although no tropical cyclones are currently forecast to affect the Australian region in the coming week. In the last couple of days tropical cyclone Kenanga developed over the Indian Ocean, just west of the Australian region. This system is expected to intensify and move further away from Australia in the coming days, remaining over the western Indian Ocean. The MJO is forecast to maintain similar strength and track further east across over the Maritime Continent, increasing the likelihood of monsoon development in the coming fortnight. However, current weather models do not suggest monsoonal flow will develop in the coming week. Just noticed, the title of the thread is misspelled. 'Cycones'. 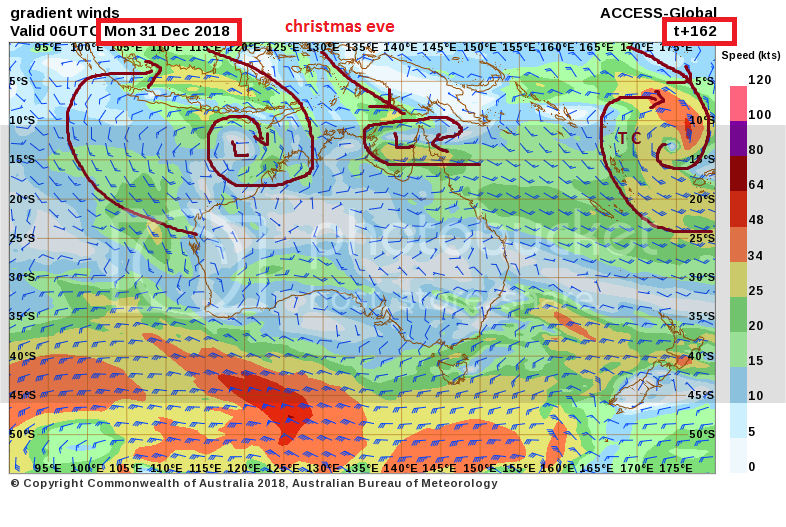 Monsoon trough is clearly evident on ACCESS windstreams 27th dec 2018 along latitude 10s. ACCESS 7 day forecast ( windstreams). On the monsoon trough at latitude 12s. 2 tropical lows and one TC(out of our jurisdiction). GFS has been throwing up various Cyclones in the Coral Sea and Gulf for a couple of weeks now, keep moving the dates out. It was originally showing them close on New Years day, but now move them out to around January 10. Still good signs that something should form somewhere. I've been watching the long-term GFS too Bundy with morbid fascination. The latest one is the most intriguing with two systems doing the Fujiwhara dance. What we do know is that there will be a very active monsoon that will spawn at least one and maybe more TCs. Where they will form and which way they will go is anyone's guess at this stage. Have a look at GFS 18z run, at 360 mark, big and scary. Please continue discussion in the relevant QLD/WA/NT cyclone threads. 7 registered (Mike Hauber, Knot, sebbie78, Steve O, Adaminaby Angler, wet sky, 1 invisible), 55 Guests and 3 Spiders online.